Home Tags Posts tagged with "Public art"
Tell us about The Migration Project – your large public commission in Wollongong – and, in particular, the process of working with the community and fabricators to realise it? I saw this commission advertised by Wollongong City Council and, because it was about migration, I decided to apply for it. It was a major landmark site which demanded that it be a silhouette shape and quite tall. Responding to the theme and site, I designed a skeletal boat frame with ladders. I knew I wanted to use steel because being in Wollongong it made sense, and I knew I wanted it to be made locally, as opposed to suggestions that I send it offshore for fabrication. During the process of figuring out how I was going to make it, the cost kept escalating and I realised that I couldn’t afford to use the stainless steel that I’d proposed, so I put out an email to the migrant community who had been instrumental in instigating the project. I had a generous response from a man offering help at every stage from steel fabrication to in-kind support for installation. It was such an exciting development because he also wanted to involve local people and I realised the project was going to have that real community involvement. In the end, his support meant that I was able to work closely with this fabulous steel manufacturing company. Then, Council came back to me and said they wanted more work. From what I’d already submitted they chose one that involved three laser-cut steel panels on poles. Fortunately, there had previously been an historian commissioned to do local research, so I was able to draw on that work, as well as on local photographic archives for my imagery, which helped connect it to the community. It took more than a year to realise it. Last year, Blacktown City Council commissioned you to undertake another public artwork at the Glenwood Community Hub. Can you describe the process of community engagement in realising that project? Again, this was a commission for which I was invited to apply. I believe they picked my submission because I mentioned there would be an extensive community engagement process in the lead-up to it. Glenwood is a relatively new Western Sydney suburb hemmed in by three major motorways. It is also home to a Sikh Temple, so a lot of Sikh people live there, but beyond that it’s a very diverse community, so I felt the project needed to be about diversity. I got the idea to make the project about plants through observing my Sri Lankan neighbour. She was a terrific gardener and she grew all the things that she had in Sri Lanka – okra, chillies, lime – and I realised I had planted kangaroo paw because I’m from Western Australia. I thought these plants have meaning for her in the same way as this plant has meaning for me. I was curious to know what plants the people of Glenwood planted to remind them of home. I decided to conduct a survey through a series of drawing workshops with kids from Glenwood High School, with people who use the Glenwood Community Hall, and I went to the Sikh Temple and had talks with people about the plantings there. Marigolds featured prominently in that research. Then, in more depth I had engagement with a group of Indian women. I spent more time with them and realised that they did henna painting, and so they loved doing really intricate drawings of plants. I was surprised by some of the plants which were popular with them – basil, for instance, frangipanis, mustard, and cherry blossom. There was a whole range of plants that came up. 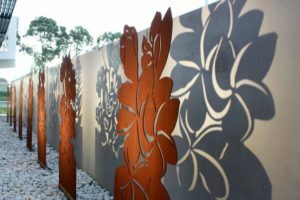 I chose eight of the plants which featured most and then created the designs which were to be a row of laser cut steel panels to be installed outside a glass wall of the new addition to the Glenwood Community Hub. I’d collected comments which formed the basis for texts etched onto the glass in front of the panels. The effect was a layering of meaning. When people came to the centre they knew what the work was about – they had had some input to it and therefore had some context for it. The design came from me, but the content came from them. Your work has a very poetic quality. What artists have influenced your own practice? I look at work all the time, but there’s one I’ve been thinking about – Krzysztof Wodiczco. Even though he’s a video artist and that’s not my medium, I really like the way he works with people and the content of his work. I’ve read about the way he engages with people and he really manages to get under the surface of issues. His projections are on public sites, often monuments, and that means they change the perceptions of that place. Even after the projection is gone, it lingers in the memory. His work is often about people who are marginalised, people who don’t have a voice. That approach appeals to me – how artists can be successful in bringing those issues to the fore. Closer to home, I am interested in Hossein and Angela Valamanesh because their work is so poetic and beautifully made and, again, has that cross-cultural aspect. It speaks about coming from somewhere else and how one culture is laid over another, because Hossein comes from Iran. Other artists whose work has interested me recently have been Alfredo and Isabel Aquilizan. They come from the Philippines, and work closely with the Filipino community gathering things – objects and stories – and also allowing the process of participation in building installations. Like many artists, you also work as a teacher. How has teaching influenced your practice? It is a way for me to hone my skills in communication and understanding other people, so I feel more confident stepping into a situation where I’m working with groups. When you work in a socially engaged art project, the criticism often is that you fly in and fly out again. The challenge for the artist is to really meet people, get to know them and that can take time. I think that teaching has given me the skill – a way to give something back, to get people involved. It’s also a way to survive as an artist. Apart from that I do really enjoy it – the energy of engagement. I feel it’s a great privilege to be in that role. Your personal circumstances have changed dramatically this year with your cancer diagnosis. Could you talk a little about the impact this has had on the way you are thinking about your practice? Yes, we should perhaps explain that this interview is happening in Day Therapy (at the Chris O’Brien Lifehouse Cancer Centre) while I’m receiving chemotherapy. I’ve had a lot of time to reflect on how things were before I got the diagnosis and then after I got the diagnosis. Before diagnosis, I was about to start a project in Blacktown called Social Scaffold working with people who were learning English and I was very disappointed not to be able to do that – it really stopped me in my tracks. I’ve thought a lot about how I would love to get back to doing that project. I’d also just embarked on a PhD at Sydney College of the Arts and that had to go on hold too. Getting well, taking care of myself, has been like a full-time job. In the beginning I thought that I’d put everything on hold and come back to it, but I think something deep within me has shifted – it has to because it’s a life-changing experience. I’m sure there’ll be some way that I can use the process of making art to work through this, maybe not right now, but it will come out later. My friends have been a great help to me, and I really value the support offered by the staff at Blacktown Arts Centre and being included in the Diaspora-Making Machines exhibition. Also I’ve been thinking about the artist residency program here in this terrific building (Chris O’Brien Lifehouse). When I was first diagnosed and coming along to appointments here, I met Renuka Fernando, who was artist in residence. I was here with my son and we got the chance to participate in her workshop. It was a role reversal for me; usually I’m the one facilitating that kind of activity. I realised how important and enriching it was, and now every time I see that space where she was working, I really miss her presence. It wasn’t until then that I thought, ‘Ah we artists really do make an impact on the people around us’, which was very affirming. I thought maybe when I’m finished all this I might like to do something here. But I don’t know where this will lead, what’s coming up next, but this situation is bound to impact on my practice. Diaspora-Making Machines is an exhibition that explores the systemic devices (the machines) that generate movement and the dispersal of communities (the diaspora). Blacktown is a site of continuous waves of migration. Since Governor Macquarie issued the first land grant to Nurragingy and Colebee in 1816, communities have been moving to Blacktown – sometimes by choice, sometimes by force. Eight artists engage with Blacktown’s historic place as a centre of migration, our attitudes to newcomers, and notions of belonging and assimilation. Elin Howe is an art historian and writer with an interest in contemporary art. She has taught art history/theory at university and TAFE. 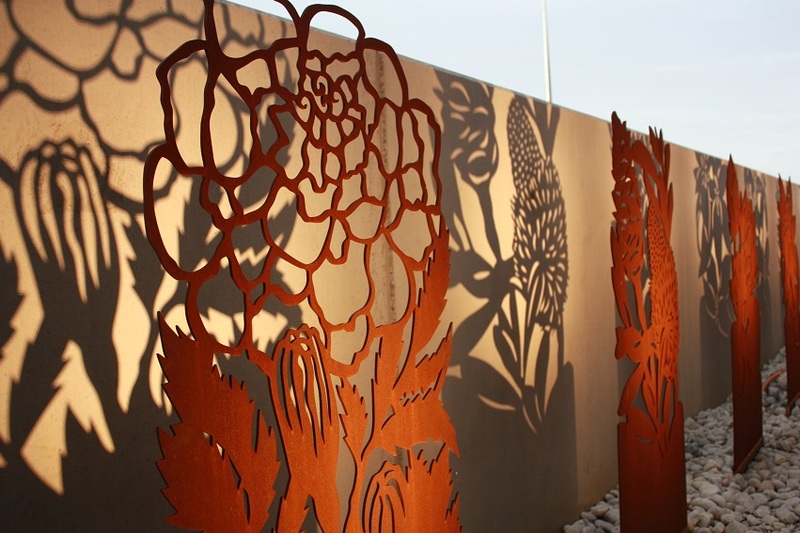 Cultivations, public artwork for Glenwood, 2015, eight Corten steel panels. Migration Project, public artwork in Wollongong, 2015, stainless steel and Corten steel. For many years, the central theme in your studio works is migration and its aftermath. What draws you to this subject, and what sustains your interest in it? I wanted to make art about things that are happening around me and things that I observe and think are important. Migration is an issue in Australian culture that is important, and it’s good for artists to be thinking about these things: to have a greater understanding of what it means to be in somebody else’s shoes, and to understand what other people have gone through. It’s not my own experience – it’s experience within the community, and I’m curious to learn what it is they’ve experienced. Your practice alternates between studio and community-based projects. What is attractive about these different practices? I really like working with people. When I work on public art commissions I want to engage with the community that is going to be living with the work. I’ve realised this engagement with community has become one of the strengths in my practice, and it’s something that I’m really attracted to, but I also find it can be quite exhausting. So that time in the studio on your own is another way of reflecting on those experiences. One feeds into the other. I also find developing a body of work on your own is very valuable and gives you time away from all that really hard work of engaging with people – it can be very stimulating, but it takes a different form of energy. I’ve also been taken with what the philosopher Roman Krznaric writes – the importance of empathy to balance out the focus on the individual in a consumerist world. We have been encouraged to focus on the individual, to search within ourselves. However, there is a need to look outside, to consider our place in and our impact on the world. 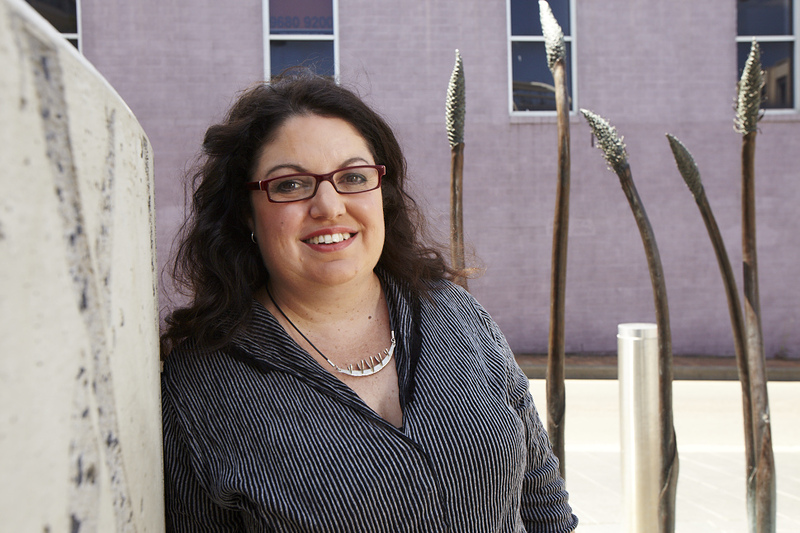 Participating in socially engaged artwork can lead to an empathetic experience. As a child were you creative? Yes, I’ve always thought of myself as an artist. I can remember being five and thinking to myself, I’m either going to be an artist or a musician. I don’t know why I thought that because we didn’t know anyone who was either an artist or a musician. In my family it wasn’t thought to be a realistic career option. I was just really attracted to making things and to being creative. I played classical guitar and clarinet when I was growing up, but it wasn’t until I went to art school that I thought, ‘Ah, this is what I’m about. This is where my people are.’ All along I’ve felt like a real oddball, and now I fit in. In 2006, you did a six-month residency in Hue, Vietnam. How has that experience influenced your work? That was absolutely transformative – very much a life-changing experience. Although I hadn’t had much opportunity, I was itching to travel all of my adult life and finally I got the chance in 2004. I received an invitation to be part of a sculpture symposium in Vietnam, but I didn’t have enough funds to go there for the full month, so I was going to pass it up. Then I was given this great gift by the College of Fine Arts, UNSW. The Dean, Ian Howard, awarded me a grant to go there for three weeks and do some research and it was just fantastic. I didn’t have the chance to participate in the symposium, but I travelled around and met a lot of people. I met some terrific people at the Hue College of Arts and I came up with the idea for my sculpture Life Boat on that trip. It was two years before I could go back in 2006 and participate in the sculpture symposium collaborating with another Australian artist, Claire Martin. We built a work – a public artwork – which is there in Hue, as part of the sculpture symposium. I then stayed for six months to work on the Life Boat project. I had really thought that work through, really knew what I wanted to do, and had fostered these relationships. That meant I had connections to help me realise the work – connections to help me get a studio space and accommodation, someone to help with translation, local craftspeople with boat-building skills who could help me with fabrication. It was a big time, and then I was offered the opportunity to display the sculpture in Hanoi at the Museum of Ethnology, and then to transport it to Sydney. It was a big risk, I didn’t have a budget for this, I just did it and it really paid off. 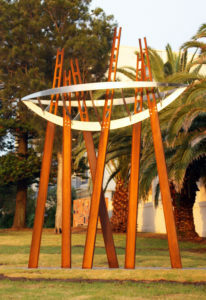 It was exhibited in Sculpture by the Sea, and then selected for the Helen Lempriere Awards where it won the Popular Choice, and then it was purchased by artsACT and is permanently on display in the Civic Library, Canberra. It was a huge turning point in my career and my life. It made me feel free because I realised I could make something so big, and take a big risk. Tell us what that work is about, and how it fits into your migration theme. When I was growing up in Perth, I knew Vietnamese people who had come here by boat. So when I went to Vietnam, I thought about that issue, but in Vietnam, obviously I didn’t want to make a work about boat people. The work is about boats, and life on the water and its spiritual significance in Vietnam. But when I moved the work from Vietnam to Sydney, a shift in the meaning occurred. The work was inspired by the bodhisattva, the multi-armed deity. Instead of oars, it has arms. The hands are carved from recycled timber – wood from old Vietnamese houses – and coated in Vietnamese lacquer. The work is about compassion and connection, but when I exhibited it in Sydney, Vietnamese people identified with it differently – they told me it articulated the story of their journey here. In fact a friend who had come here by boat purchased the smaller version, the maquette, and wrote a story about his journey in response to the work. It was an issue that I thought a lot about. It’s not my own experience, but rather the work grew in meaning by knowing people and listening to their migration stories. Your work often distils complex meaning in a single motif, for example, the anchor featured in the Diaspora-Making Machines exhibition. Why did you choose this motif? Sometimes things just come together like in the Life Boat – the boat and the arms. It’s almost magical. You know you want to make a work about boats and then you see the arms and then the arms become the oars of the boat and that just works. 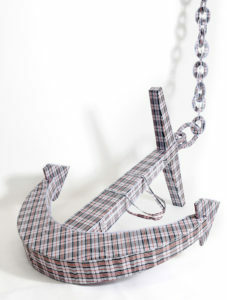 With the anchor – I knew I wanted to make a work about an anchor. My father was a sailor and at the front of our house he had installed an anchor. As a child I used to think that the anchor was holding the house down. Years later, some 25 years later in fact, I went back to see the old house and the anchor was still there, so that stayed in my mind. The trigger for using it as a motif in a sculpture was witnessing the largest number of people displaced in Europe since World War II. In 2015, on television screens, from the comfort of our lounge rooms, we watched waves of displaced people at sea in small flimsy boats, being hoisted from the ocean, or walking long distances in search of freedom. I was feeling a mix of empathy and powerlessness. The sculpture speaks of opposition – the anchor symbolising safety and security. However, this anchor is covered in checked plastic – the type associated with cheap carry bags, poverty and mobility. I also recently read this story by Debra Adelaide called ‘The Master Shavers’ Association of Paradise’ (in A Country Too Far, 2013, eds Rosie Scott and Tom Keneally). It’s about a man, a refugee, who was given one of those plastic carry-all bags, but he had so few belongings to put in it that it just looked like a crumpled heap. I thought about that checked plastic and how everyone has a relationship with it. We use it to move our belongings from one house to another, but what if that was the only thing you had to contain all your belongings and what if, even then, everyone else’s looked like a nice square little brick and yours just looked like a crumpled heap. That story really struck me. So in that way the two things came together – the anchor being about security, being anchored and the plastic being about poverty and mobility. In Part 2, Nerine discusses the joys and challenges of creating large scale public commissions, and how she facilitates the process of community participation in her creative projects. 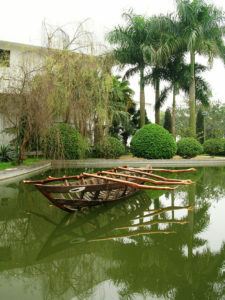 Life Boat/Thuyen Cuu Roi, 2006, 650 x 3350 x 5050 mm, wood, steel, lead, lacquer. Between Certainties, 2016, 1040 x 1870 x 1320 mm (plus chain), plywood and woven plastic bags. Nerine Martini by Joshua Morris. Between Certainties by Mike Buick. We acknowledge the Darug people who are the traditional owners of the Land on which we work. We pay our respects to Elders past and present, and thank them for their Custodianship of this Land. Sharing the dynamic, culturally diverse artwork that reflects Blacktown, its history and its communities, and the inspiring artists who make it, this is a place for exchanging information and a home for important discussion. We foster community through commentary and conversation about arts and culture. We welcome your comments and encourage your questions! This is how we make art. On a weekend in May 1995, John Cheeseman and I hired a truck and collected all of Street Level’s assets and drove them to Casula Powerhouse Arts Centre in Liverpool where they remain. It marked the end of Street Level’s five-year period at 41 First Avenue Blacktown. It also initiated the third and final phase of Street Level as an artist-run initiative in Western Sydney. This final phase was led by members Kathy Cleland and David Cranswick curating exhibitions and events across sites in Parramatta and the then-new Casula Powerhouse until 1998. After the closure in 1983 of the Modern Art Gallery in Casula (run commercially by artist Alice Klaphake), there was no contemporary art space between Annandale and Penrith Regional Gallery & The Lewers Bequest in Emu Plains. In 1988, the Campbelltown Bicentennial City Art Gallery came into operation, and Street Level was incorporated as a not-for-profit artist-run initiative, the first in Western Sydney. A part of Western Sydney University, it was established by about 30 former students of the Nepean College of the Arts, led by Katie Soady, Albertina Viegas, Diane Wallis and Atina Hrstic. With funding from members and the Australia Council for the Arts, the new initiative rented a shopfront at 213 High Street Penrith, launching its first program in 1988 – an Albertina Viegas installation of bamboo and domestic implements as weapons evoking resistance and resilience in the face of the Indonesian invasion of East Timor. From the outset, Street Level members wanted to connect the region to a network of artist-run initiatives nationally and internationally to engage with art and ideas. They also felt it was necessary to take up social issues of the time such as Aboriginal land rights, community television, the environment, vivisection, gay and lesbian equality and East Timorese independence. They tried new ways to present art to the community and to provide professional experience for artists and curators. The second phase in Street Level’s history was the collective’s move to Blacktown. They leased a shopfront – a ‘bunker’ – with space to establish six artists’ studios and a gallery. The collective immediately engaged with the local hip-hop scene. They set up a legal wall for graffiti writers and an exhibition called Thrill to Chill which commissioned new graffiti writers to paint the gallery walls. The constantly changing legal wall outside, and a new exhibition/events program inside every two weeks, established a constant aesthetic dialogue on Australian hip-hop and visual arts. Over time, Street Level was run by voluntary curators and artists developing over 200 exhibitions and events. By various ingenious means, they all activated a collective awareness of arts culture in Western Sydney. Text featured in the It’s Our Thing exhibition catalogue, available online at www.issuu.com/blacktownartscentre or at Blacktown Arts Centre. Blacktown’s influential role in the history of Australian hip-hop takes centrestage in a vibrant new exhibition. 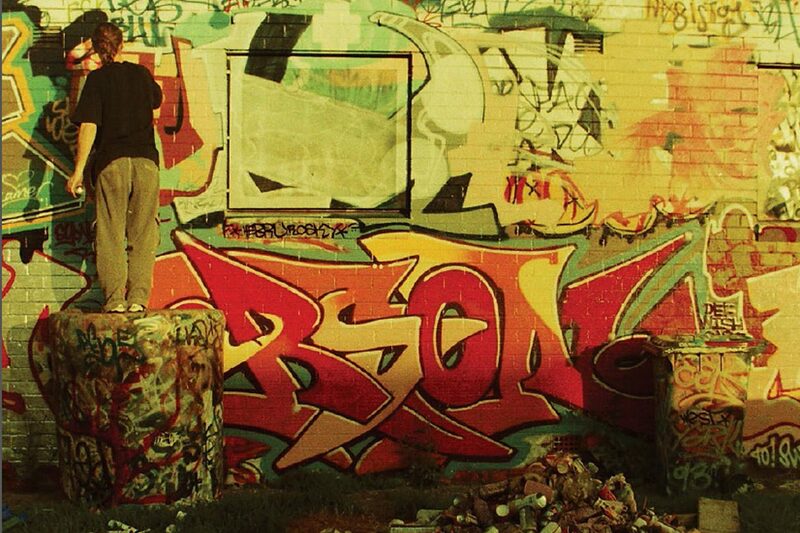 It’s Our Thing revisits the emergence of this dynamic sub-culture in Blacktown in the 1990s and examines how the collaborative practices and styles of hip-hop culture influenced the work of contemporary artists Khaled Sabsabi and Minky Rawat. Sabsabi and Rawat present new and archival artworks, alongside works by some of the most iconic artists of the 20th century – Joseph Beuys, Pablo Picasso and Andy Warhol.